bukd lets you book, order & pay from your mobile. Life’s short, have fun, get bukd! on the market for bars and restaurants! Going to a game or the theatre? When your venue accepts bukd that mad dash for a drink ain the interval will be dramatically eased by using bukd to make pre-orders. The bar can even let you know when your order is ready. Mad busy at the bar? No worries. Use bukd to order your drinks and save the hassle of queuing. No more busy period crush or last orders mayhem. Oh and you don’t have to carry heaps of cash or even have your credit card with you. The bukd payment system handles it all. 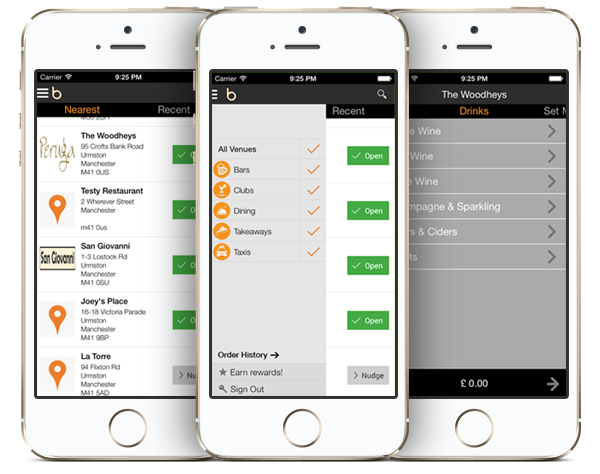 You no longer need an app just to do takeaway. With bukd, you get this great service built in. By using bukd, you help your local takeaway stay profitable, as there is no fixed charges for bukd to operators – they can pass those savings on to you! With bukd’s low cost service, you will be able to find hotels and B&B by location. Greta when you’re travelling on spec and come across a spot you want to stay. With bukd, you can find tickets to a specific event, show or even a meal at a restaurant. Life will be so much simpler when you can handle your entire night out with bukd. When your club accepts bukd, you know there will be no issue on ID, as you can be pre-screened. Some clubs are even using a “bukd VIP” entry system, so no queueing at the door! Become an instant celeb with bukd! When a restaurant accepts bukd, you can use the bukd table booking service to book either a special offer they are promoting through bukd or simply a table for tonight or some future date. Use bukd for either last minute bookings or to future book for an important occasion at that special venue. With bukd, your restaurant will know who you are, what you like and can ensure you get the personalised service you will come to expect when using bukd. With bukd, you will soon be able to book a taxi (or limo) to handle all your travel needs. Plan your whole night out from going out, right through to taking you home again from your night out. The bukd rating system will enable you to check the service of the driver and taxi company. Plus, the free to use built-in bukd tracking system means your friends and family are sure you’re safe. Not sure what you’re doing tonight? Check out bukd offers to see if we can tempt you out. By using bukd offers, venues are able to offer you extra special last minute deals, (or possibly special offers for their selected, loyal customers). Want your hair doing last minute before a night out? bukd will show special offers and list all the local salons in the area. You can organise getting ready for your night out, right up to how to get home at the end of the night paying for it all using bukd. We welcome you to our brand new mobile ordering app. bukd is currently being rolled out to venues nationwide to aid and enable mobile ordering in your local restaurants and bars. Take a look around the website for more information about what we do.